NASA’s last remaining, launch-configured Saturn IB rocket is receiving a much-need restoration at the Kennedy Space Center Visitor Complex in Florida. KENNEDY SPACE CENTER, Fla. — An extensive effort is underway to save NASA's last remaining flight-configured rocket of the same type that launched the first Apollo astronauts 50 years ago. The surviving, mostly-intact Saturn IB booster, which for decades has laid on its side, spanning the length of the Rocket Garden at NASA's Kennedy Space Center Visitor Complex in Florida, is now receiving a much-needed restoration. The 220-foot-long (68-meter) artifact was never used, but briefly stood ready for a launch. The Saturn IB (pronounced "one-B") was the smaller, less-powerful forerunner to the Saturn V rocket that famously lofted the first astronauts to the moon. It was a Saturn IB rocket that launched Apollo 7, the first successful mission of NASA's lunar landing program, with the United States' first three-person crew to enter orbit together — Wally Schirra, Donn Eisele and Walt Cunningham — in October 1968. Later, after the lunar landings had been completed, it was again the Saturn IB that was used to launch all three crewed launches to the Skylab space station in 1973, and boost the U.S. half of the first joint mission with Russia, the Apollo-Soyuz Test Project, in 1975. The Kennedy Space Center Visitor Complex exhibits SA-209, the only Saturn IB to still be in its launch configuration. In 1973, the rocket was prepared as the rescue vehicle for the last Skylab crew, going as far as being rolled out to the launch pad that December. Fortunately it was never needed, and so it then became a back-up booster for the Apollo-Soyuz Test Project before transitioning to an artifact in 1975. 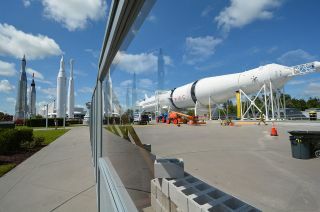 Plexiglas windows cut into the construction walls gives guests at NASA’s Kennedy Space Center Visitor Complex a view of the work restoring the last remaining, launch-configured Saturn IB rocket. SA-209 began its long-term horizontal display at the Kennedy Space Center after briefly being exhibited in Japan as part of the 1978 Space Expo in Tokyo. Outfitted with cutouts (since painted over) so the public could see the upper stage (S-IVB) J-2 engine, the Saturn IB was further modified by the replacement of its eight first stage H-1 engines with replicas. Now, decades later and behind recently raised walls that surround the rocket and feature plexiglas windows so the public can watch, conservators and engineers are beginning 16 months of work to repair and fortify the booster. NASA, which still owns the rocket, has contracted Conservation Solutions of Maryland and Guard-Lee of Florida, as well as Ivey's Construction of Florida, to conduct the restoration. The work will include temporarily separating the rocket into its stages to access its interior structures. One component already identified for restoration is the "spider beam," an octagonal framework that holds the first stage propellant tanks together. While much of the work will be done in place where the public can watch, some of the restoration will require moving components to specialized facilities. At 220 feet long (68 meters), the Saturn IB stretches almost the full length of the Rocket Garden at NASA’s Kennedy Space Center Visitor Complex in Florida. "Some of it is being done on site, some of it will be going back to Guard Lee," said Protze in an interview with collectSPACE. By October 2019, around the same time as the 51st anniversary of the Apollo 7 mission, SA-209 is expected to be fully restored and ready to debut back on view. "We have discussed enclosing it, but those plans are not finalized yet," said Protze. "We brought the best of the best in to redo the rocket, inside and out, and so I feel confident that if it was to stay outside, it would be good for another 20 to 25 years." Funding for the Saturn IB restoration, as with the other rocket and artifact displays at the Kennedy Space Center Visitor Complex, is underwritten by admissions and concessions sales. The budget for the Saturn IB restoration was not released. See more photos of NASA's last intact Saturn IB rocket under restoration at collectSPACE.